There’s a little bit of everything in this post, including drinks with Trudeau! Apparently it makes people worry when you say you are leaving one island then don’t post another blog for a while. Sorry about that. Once we left St. Martin, we a) had even less access to the internet, b) less time to blog and c) less inclination to blog. When we left St. Martin on December 20, we were ready for some R&R. We had put in our time – 7 weeks in fact – getting the boat ready to launch, and we needed a break. And upon arriving at Île Fourchue in St. Barts, that’s exactly what we got. 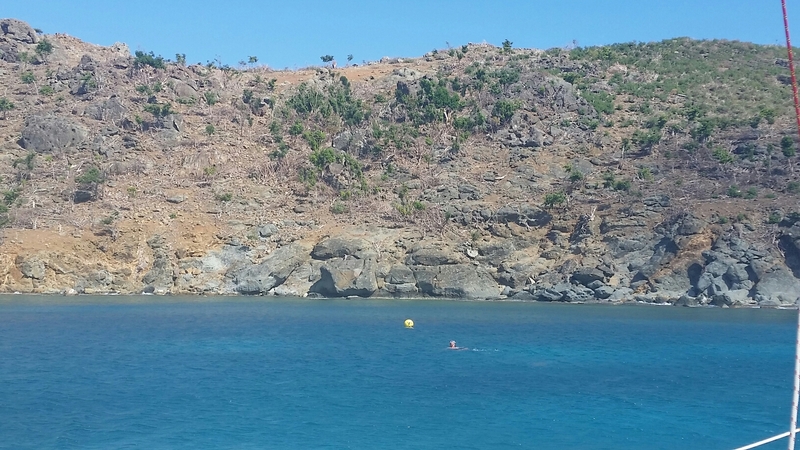 For two days, we were nestled in the bay of this small island north of St. Barts, with only one or two other boats. It was heavenly. Crystal clear blue waters, where you could see the fish hiding in the shadow of the boat. This was an idyllic time, where we lazed around on the boat, reading, drinking and eating. This was the good life. 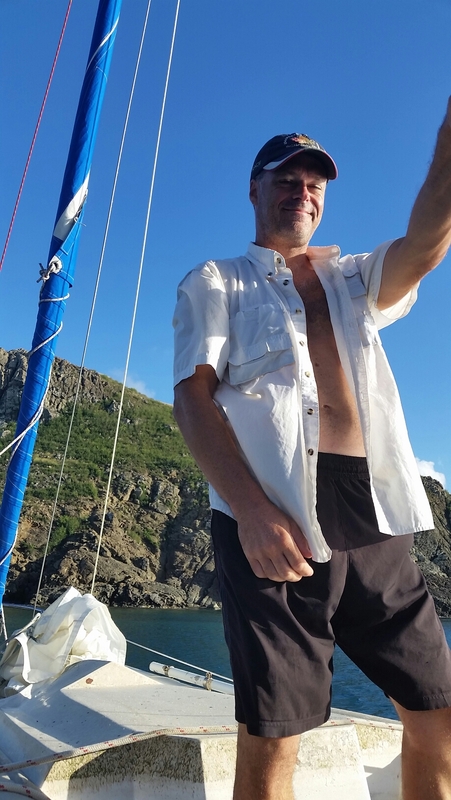 Two days later, we moved to Anse à Colombier, another scenic bay on the northwestern edge of St. Barts, where we went for hikes, swam, snorkeled, and watched sea turtles surface all around our boat by day, and the myriad stars shining in the sky by night. View from above. We are the third boat from the right. Christmas lights up! So festive. While in St. Barts, we had to go to the capital, Gustavia, to clear in. Clearing in is the administrative process all boaters must go through to announce their presence in each new country they visit, and is usually done by visiting the Customs office in the port. While in Gustavia, we realized it is a playground for the rich, with giant superyachts both in the marina and anchored just outside the port. So if you’re running low on Gucci or Prada, Gustavia is the place to get it. That said, being a French island, St. Barts is also a great place for croissants, baguettes and pains au chocolat, so there’s something for everyone. The sailboats in the middle are about three times the size of ours, but they still look miniscule next to the mega power yachts. We stayed in Colombier for Christmas, and celebrated by inviting our new neighbours from Nantucket over for dinner: foie gras, ham, sweet potato and vegetables, with shortbread for dessert. We still manage to eat well on the boat, even when we’re in the middle of nowhere. After Christmas, our boat decided we had gone long enough without fixing anything and promptly put an end to our R&R. It started when we found our fridge unexpectedly and repeatedly filling with salt water, despite our efforts to bail it out. Then the toilet kept uncontrollably filling with salt water. Then our waste tank failed, which is pretty much the grossest thing that can happen on a boat. So we spent the next few days finding bandaid solutions and cleaning up. We will spare you the gory details. 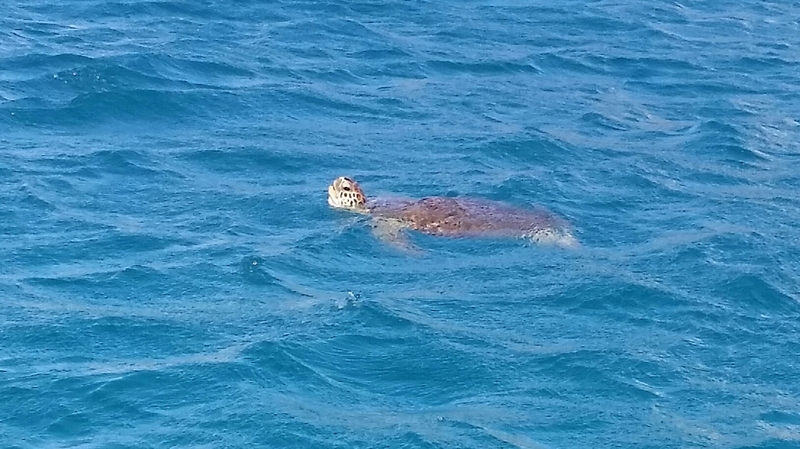 After a week in Colombier, we decided to clear out and head to St. Kitts, just 40 nautical miles from where we were. We stocked up on French food and wine, then we were off! We had an amazing sail to St. Kitts, with the wind perfectly in our favour. We arrived in St. Kitts in the middle of its Carnival, a party that goes on for two weeks. Since we were staying first in the harbour, then in the marina, both of which were in downtown Basseterre, it made for a few sleepless nights. Basseterre is a popular stop for cruise ships, which creates an interesting dichotomy in the users of Port Zante, a newly developed area catering mainly to tourists. When the cruise ships are in Port, the place is packed and bustling with activity. But the rest of the time, it is a ghost town. We knew that this two block radius of tourist traps was not representative of St. Kitts, so on New Year’s Day we left behind the tourist drag and walked further up into town, where we heard there would be a parade. Kittitians of all ages take part in Carnival, and it was really amazing to see this great celebration combining centuries-old traditions with modern-day life. We also took the time to do some sightseeing, and visited Brimstone Hill Fortress, a UNESCO World Heritage Site which offers an informative exhibit of the island’s history, not to mention gorgeous vistas. At this point, our fridge finally failed for good, and we were relying on ice for refrigeration. Since Carnival goes until January 2 in St. Kitts, this meant a significant lack of availability of ice, as well as a significant lack of availability of fridge repair mechanics. So it was time to move on. We made a couple of stops while waiting for a good weather window to sail to Antigua, anchoring first in beautiful White House Bay in St. Kitts (where there are no white houses, by the way), then Charlestown in Nevis, where we went on yet another wild goose chase for ice, and hung out with the PM at Sunshine’s Beach Bar. Love that the boat on the right is named Chuck Norris. As seen on Pinneys Beach, Nevis. Where the wind takes us next: Antigua! Another amazing adventure! Looks like you have lots of repairing to do… good thing you’re in warm brilliant weather! Not so much up here!!! Stay warm and safe and enjoy the journey! Glad you popped in a pic of yourself in there at the end. I was going to reprimand you for not getting in FRONT of the camera, Mel! Glad to read that all is well. BIG hugs!